A sunny day topside. Fairly flat water (nothing bigger than two foot surf), Vis 25-30' horizontal, maybe 50' vertical, some surge in the shallows. 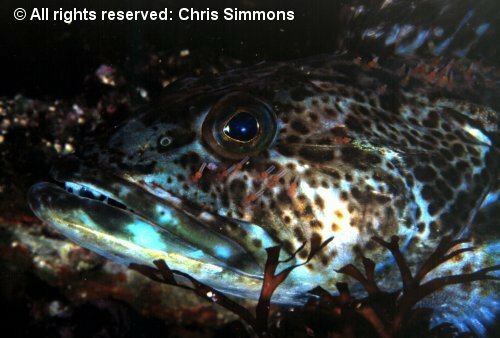 Two dives: Macro first with 105mm (13 shots, I couldn't find cooperative sculpins); WideAngle second with 17-35mm (24 shots). A beautiful day topside [sunny warm, lite wind, flat water] and underwater [80' vertical vis, 40-60 horizontal vis, no surge, lots of life]. 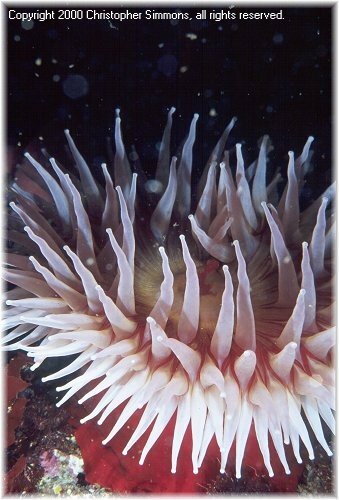 I shot 20 pictures with the 105mm during my two dives. A fair trip considering the miso soup (10' to 15' visibility in most locations; but, that's the breaks when you have sunny/warm topside conditions) in which we dove; some interesting shots. Another challenging competition: poor visibility, I couldn't find the subjects I wanted to shoot. 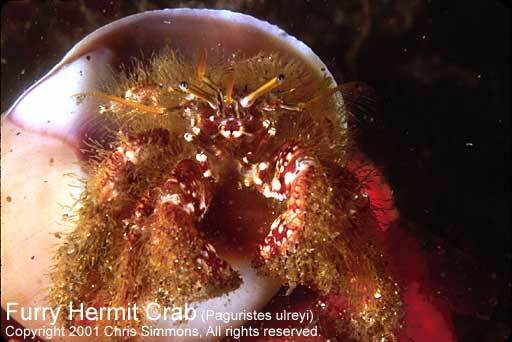 I only shot 17 frames during the two hour-long dives I did along the breakwater wall. 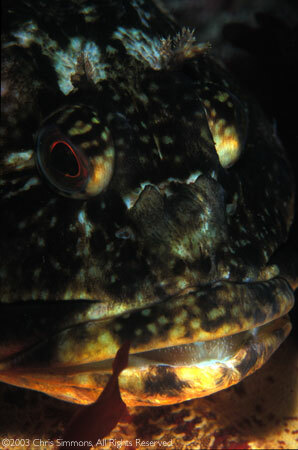 Cabezon 1, 2(same as #1, slightly different exposure), 3; I might add a few more shots. I might add a few more images as I scan them. Location: California, Monterey Breakwater at 40 feet along the wall. 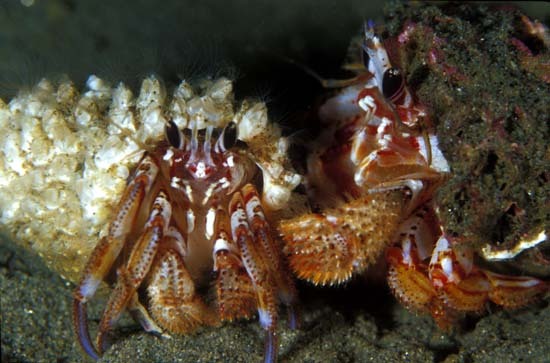 Two black-eyed hermit crabs interacting, the shell of one of them had barnacles open and feeding. 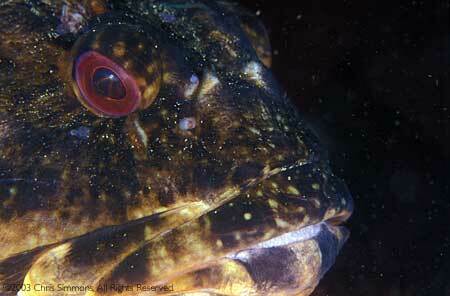 Location: California, Monterey Breakwater at 25 feet along the wall. 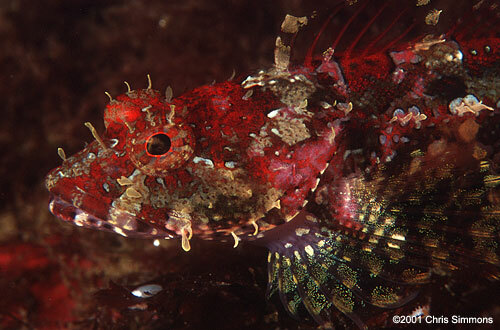 Location: California, Monterey Breakwater at 30 feet along the wall. 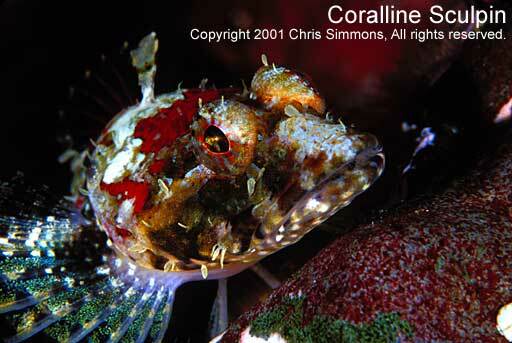 A Coralline Sculpin. Housed nikon n90s w/105mm f/2.8D and two Ikelite 50 strobes, Kodak EktaChrome VS 100 (f/22, 1/60s, TTL) Location: California, Channel Islands, Santa Barbara Island on the north side at 50 feet. 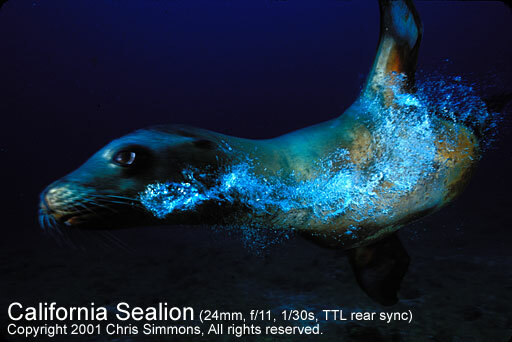 Location: California, Channel Islands Santa Barbara Island on the south side at 50 feet. 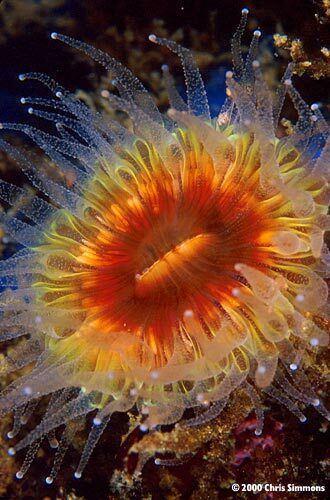 Brown Cup Coral. Housed nikon n90s w/105mm f/2.8D behind a flat port and two Ikelite 50 strobes, Kodak EktaChrome VS 100 (f/16, 1/30s, TTL) Location: California, Monterey Breakwater at 35 feet along the wall. 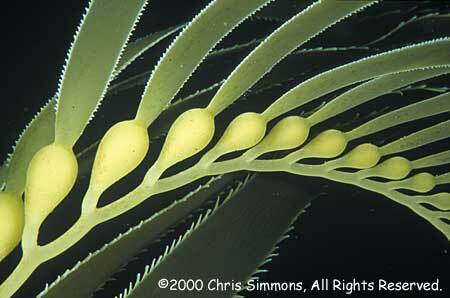 Giant Kelp. Housed nikon n90s (not sure which shot placed), Kodak EktaChrome VS 100 (f/16, 1/30s, TTL) Location: California, Channel Islands, Catalina Island in the kelp canopy. 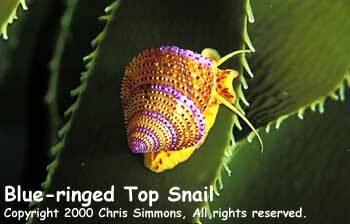 A blue-ringed top snail on kelp. 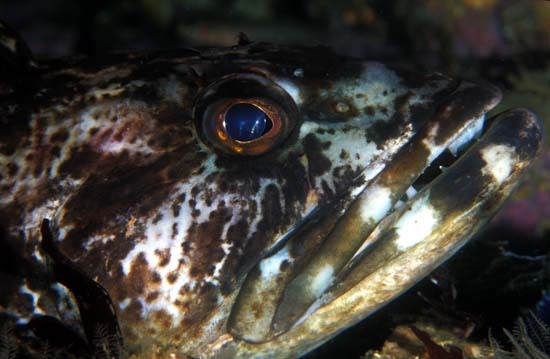 Housed nikon n90s w/60mm f/2.8D and two Ikelite 50 strobes, Kodak Elite Chrome Extra Color 100 (EBX)(f/16, 1/30s, TTL) Location: California, Carmel, Lingcod reef in the kelp canopy at 10 feet. 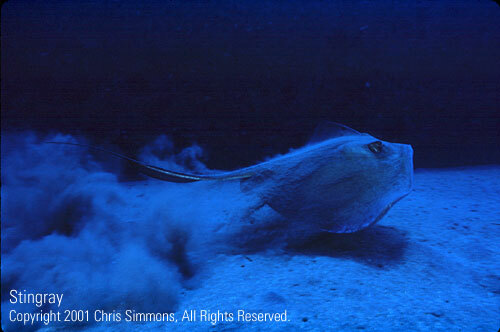 A wide angle view of a large stingray taking off from the bottom. Housed nikon n90s w/20mm f/2.8D and two diffused Ikelite 200 strobes, Kodak Elite Chrome Extra Color 100 (EBX)(f/8, 1/60s, strobes manual half power) Location: South Eastern Caribbean, Statia, Wreck City at 50 feet near barge. 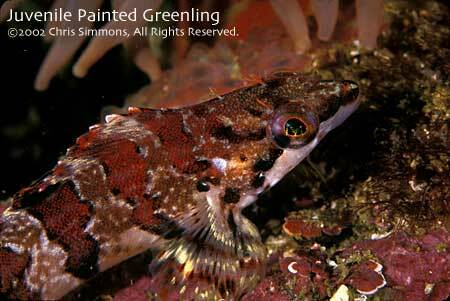 Extremely detailed variegated maroon-kelp colored Coralline Sculpin shot at 1:2 to 1:3. Housed nikon n90s w/105mm macro lens (f/22, 1/60s, edge lit with two Ike 200 strobes, Kodak Elite Chrome Extra Color 100 (EBX)) Location: California, Monterey Breakwater at 30 feet along the wall. 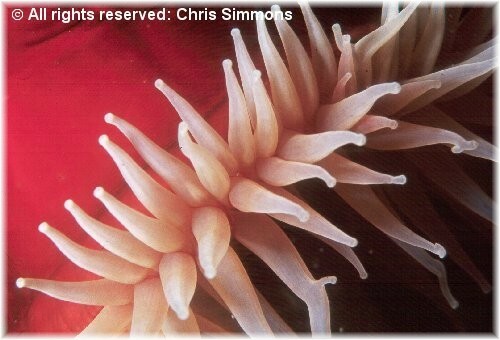 Fish Eating Anemone. Housed nikon n90s w/105mm macro lens (f/22 or f/16, 1/125s, edge lit with one Ike 200 strobe) Location: California, Monterey Breakwater at 35 feet along the wall. 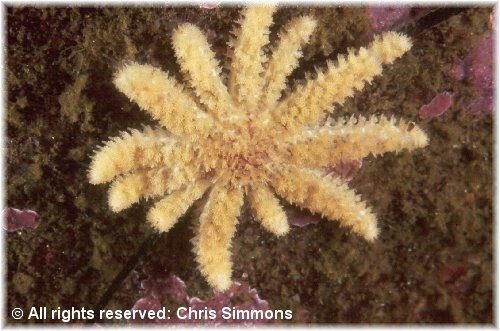 Juvenile Sunflower Star. Housed nikon n90s w/ 105mm macro lens (f/32, 1/125s, edge lit with two Ike 200 strobes) Location: California, Monterey Breakwater at 35 feet along the wall. 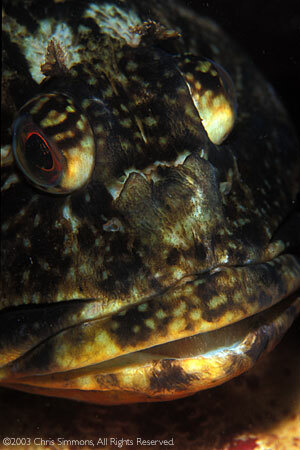 Many of the competitors have been shooting underwater for five or more years. Note: this can mean two things: a) they are a great shooter and have been continuously improving their techniques _OR_ b) they achieved a level of skill and have stagnated there. Judging for competitions is very subjective (dependant on the judges and what's entered in the competition). But, always remember: good lighting, sharp focus, excellent composition, and proper exposure will give you the possibility of getting to the final cut. Try to have something extra: personality, action, humor, and sometimes subject rarity can add an extra edge.